Well I hope every one had a great and safe 4th of July. I looked forward to a few days of relaxing and having fun, of which I did both. Today’s review will be a bit longer than normal, as I’ll be having several items in one big review. We are including some product reviews also in the mix; as well as two tobacco reviews and a new pipe in the line-up. OK first will be on the product reviews as I got a really badly ghosted pipe from friend of mine and he couldn’t get rid of the ghost in the pipe. I’m sure your wondering what the hell is a ghosted pipe? Do I need to get an exorcist or what!!!!!! For those who aren’t aware, the meaning of a ghosted pipe is that whatever was smoked in it leaves an offensive smell and taste when you smoke it again. Some tobaccos can do this from time to time, especially some aromatics. It gets quite upsetting when you paid a respectable amount of cash for a quality pipe and all of a sudden can’t get the flavor and odor of a smoke out of it. My friend had tried to clean it as best as he could and still this pipe ghosted and so he gave it to me. I figured I have nothing to lose but time in trying to fix it. The products I used on the ghosted pipe is DENI CLEAN, DECATOR HAZE-AWAY (stem oxidation remover), DECATOR SHINE-BRITE (stem polishing compound) both of which I picked up at Smokes on Main in West Bend, WI. What I did first was ream out the bowl to as much bare briar as I can get without damaging the bowl with my reaming tool. Then I used bristle pipe cleaners to ream the shank with Deni Clean also, swapped it out with regular clean pipe cleaner soaked in Deni Clean and stuffed the bowl with cotton balls to just below the rim; soaked with enough Deni Clean to get it wet (if any gets on the outer part of the bowl wipe right away to prevent accidental removal of the stain or finish on the outside of the bowl). Let it all soak for a few hours, or better yet over night. Then remove the used cotton ball and you will see the gunk that came off with it. Wipe the inside of the bowl with a rag or paper towel till clean and as dry as possible. Now is also the time to remove the soaked pipe cleaner from the shank and pass a clean pipe cleaner through it till dry also. Let the pipe air dry over a day or two before smoking it. This way you know the pipe is all dry and free of chemical; did this for the stem also. After all that I used the DECATUR HAZE-AWAY first then I used DECATUR SHINE-BRITE on the stem to rid of any oxidation, and shine the stem. For both products you just rub it on the stem and let it dry before using a rag to buff it out, like waxing your car back in the day. You will love the results visually on the stem and it leaves no bad after taste on the stem at all. Both products are very easy to use. Now for the tobacco review, and I did use the pre-ghosted pipe for test purposes to see how the end results of these products work. 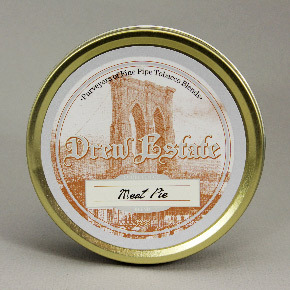 The first tobacco I’ll be reviewing is from DREW ESTATE – MEAT PIE. Tin note: Nice campfire smokiness, natural sweetness, citrus, grassy notes. Room note: Somewhat pungent from the Latakia with sweet grassy notes and nuances of fruitiness. Taste: Balanced blend that is also smooth and no bitterness, complex and rich. Notes: I looked so forward to trying this blend as I have heard great things about it. The tin art is appealing and out of the tin it is ready to pack. The tin aroma is of a rich, complex, balanced blend as I can infer from all the different tobaccos that are in the tin; from the wonderful smokiness from the Latakia, the citrus notes of the Turkish/Orientals, the sweet grassy notes of the Virginias. I just can’t wait to light it up and taste them all. After the initial char light in my Oom Paul pipe I was amazed how good the taste is. It just pops on your tongue with all of the fantastic flavors from the blend and nothing overwhelms each other. So after the first 1/3 of the bowl the taste/flavor/strength remain constant and pleasant and balanced. There is absolutely no bitterness and it smokes cool, with no tongue bite. I’m enjoying it with a hot cup of coffee with cream and sugar; it pairs well and is blissful. Now for the last 1/3 of the bowl, guess what? It’s still a fantastic smoke through the whole bowl!!!! SOOOOOOOOOO all in all Meat Pie by DREW ESTATE makes me hungry for more and more!! I highly recommend this for all English lovers and lovers of Latakia and possibly even for new smokers who want to try English/Latakia blends. You won’t be disappointed!!! Read The Huge Pipe Review – Part II here….